The 18th annual Shelflife National C-Store Awards took place in the Citywest Hotel, Dublin on the 28th of November, acknowledging retail stores and individuals that set the standards for the industry within the FMCG sector. 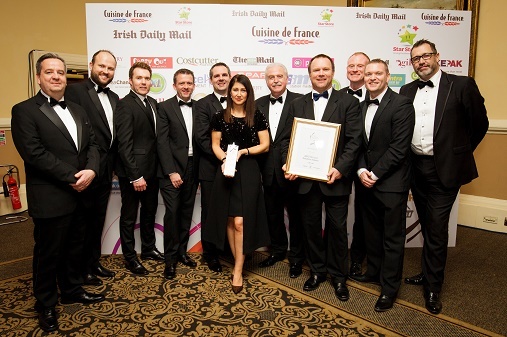 During the ceremony, ARYZTA Food Solutions Ireland was awarded the title of C-Store Supplier of the Year for 2018. This award is voted for by the Retailers, and is therefore a testimony to the value we add to their businesses. Commenting on the award, Mark Hargadon, Sales Director, ARYZTA Food Solutions Ireland, said it was an honour to receive this award. “AFS Ireland have won this award for the last fourteen years which is a great achievement, however managing to stay at the top throughout is a reflection of the hard work and dedication of all involved”. Congratulations to everyone within the AFS Ireland team who has contributed to the winning of this prestigious award.